— This article by Jerry Cates and Sergio dM, first published on 8 April 2010, was last revised on 24 April 2016. © Bugsinthenews Vol. 11:04(06). “Hi there… I live in Mexico, in Reynosa, a city that is the neighbor to USA’s south east city, Hidalgo, TX. This is the third time that I’ve found this type of spider in my house. The two times before I threw them out without injuring them, but tonight–when one came in–my wife killed it. I have to say that they look scary, yet I’d like to know what type of spider it is, and if it’s dangerous. Note: a photograph of an intact specimen from this family (though a different species, and probably a different genus) was received from Jenny, in Edinburg, Texas, on 4-30-10. That photograph is provided in a separate posting. The class Arachnida (from the Greek word Αράχνη, “a-‘rach-ne”, meaning “spider”), is comprised of eight-legged arthropods, and is divided into thirteen orders. One of these orders, Araneae, embraces what we call true spiders. 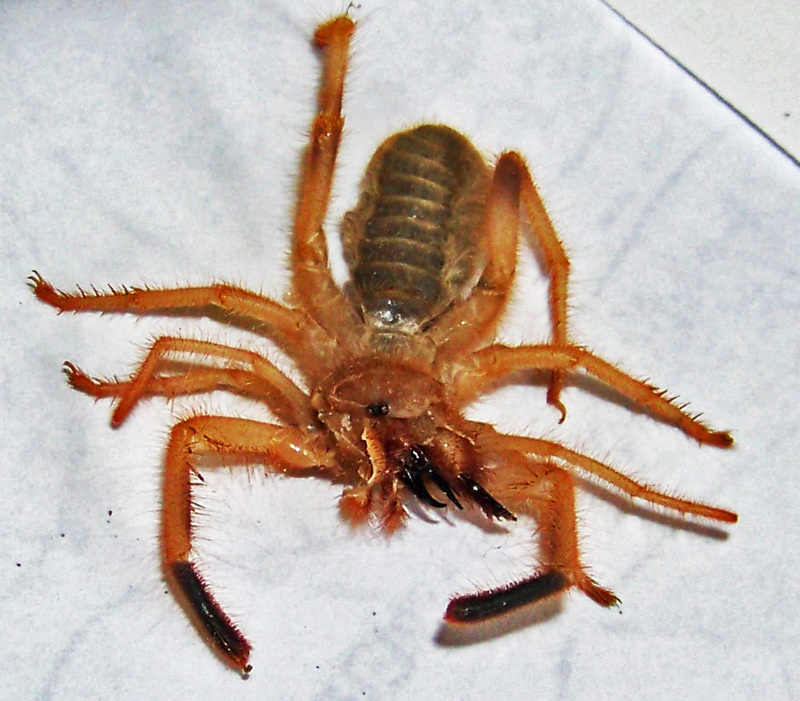 Another order of arachnids, the Solifugae (a Latin-derived term meaning “those that flee, or take refuge, from the sun“), includes a curious grouping of organisms commonly known as wind scorpions, sun scorpions, sand runners, or sun spiders. These are not true spiders, but they are closely related. Sergio’s specimen is a solifugid. And, to answer his question, no, they are all (with one exception, found in India) non-venomous and thus are not considered dangerous. Still, their jaws are strong, sharp, and structurally complicated. And because these are energetic organisms, their bites can produce jagged, relatively large, possibly painful wounds. Thus, besides pain, the risk of secondary infection must be considered. The species found in the U.S. are less than two inches long, cannot produce large wounds, and are generally considered beneficial because they prey on termites, spiders, and other insects. Several years ago, a call came in from a resident of San Antonio, Texas, who described one of these. I told the caller what she was dealing with, and asked her to take some photos. However, she was unable to do so, and the specimen she was holding in a container got away before I could drive down to pick it up. Since then I’ve hoped to see one, but none have surfaced (I visit that area regularly, but most of these organisms–though not all of them–are nocturnal, and my work is mostly done in the daytime). Thus, I’m glad to see Sergio’s photos. Even though his specimen is slightly crushed, all of its essential anatomical features are clearly visible. 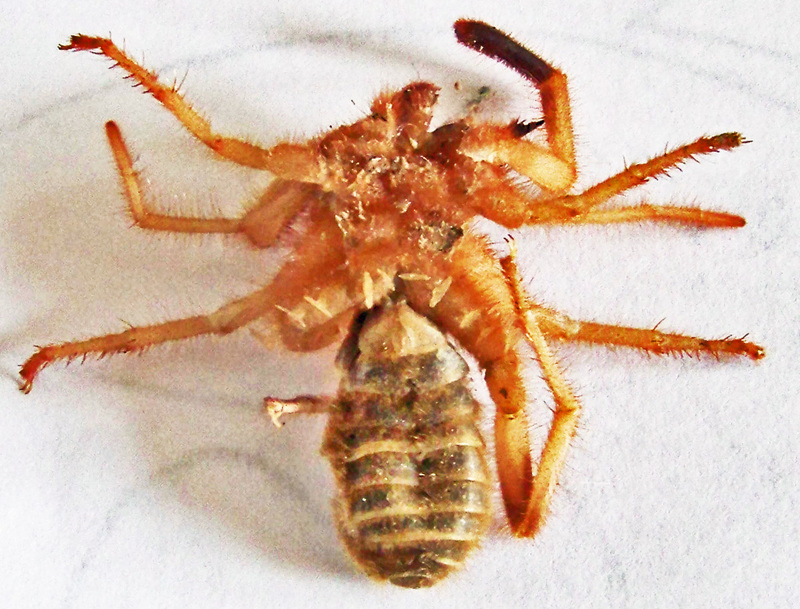 One of the more unusual features of the Solifugae is their possession of two, enormous, paired chelicerae that form separate pincers on each side of the anterior head. To some this character makes them look like creatures from outer space. In film and print, science fiction has sometimes used caricatures of these organisms to portray aliens, a caricature made more believable by the fact that they have two pairs of jaws. Yet, like for many of the less-well-known, and even less understood, organisms in our midst, truth is stranger than fiction. These arachnids, which are divided into a number of families, are scattered all over the world (except in the polar regions and in Australia). In the Middle East, U.S. troops deployed in Iraq and Afghanistan often see some of the larger species that are native to those areas. Not surprisingly, certain urban legends have emerged from those encounters. Those legends notwithstanding, these organisms do not inject anesthetizing venom (as previously mentioned, all but one species–and that one is only found in India–are non-venomous), and they do not attack animals larger than themselves except defensively. 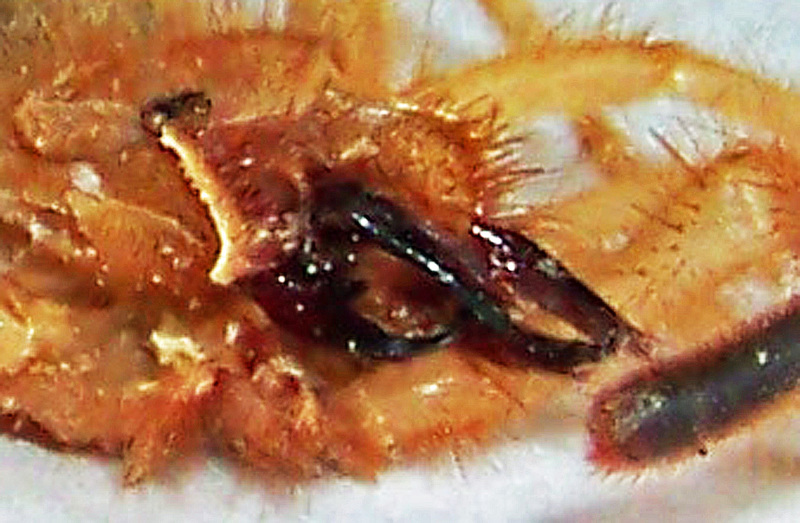 Several families of solifugids are found in the U.S. One of these, Eremobatidae, is characterized by–among a number of other things–having a single, flattened claw on the distal tarsus of Leg I. That claw, which forms a terminal segment that is obvious, even under limited magnification, is absent in Sergio’s specimen. The photo at left shows the tarsi of Legs I and II. Leg I is the more slender of the two, and shows a tarsus (the last segment of the leg) that terminates in a rounded, dark stub, without any sign of a claw segment. 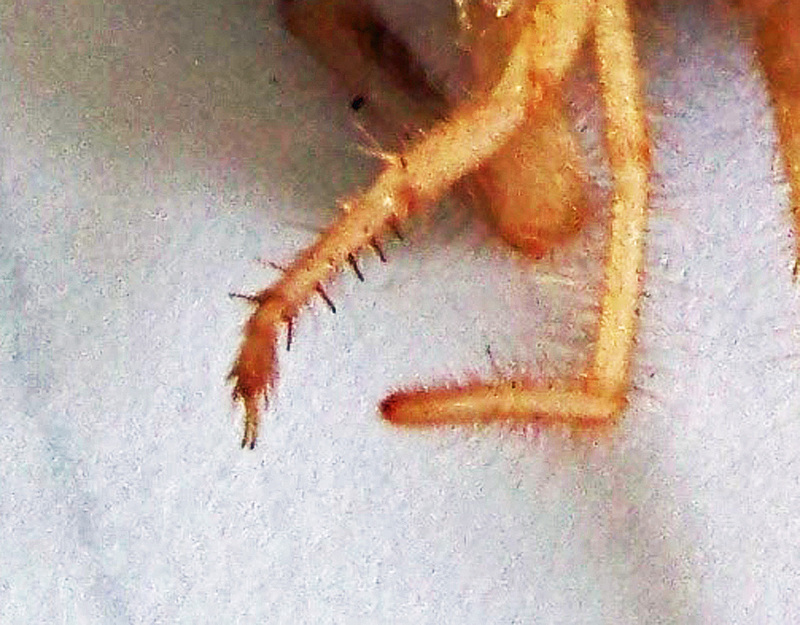 Leg II, by contrast, terminates in two slender claws, as do Legs III and IV. Another family of solifugids found in the U.S., Ammotrechidae, is characterized as having no claw on the tarsus of Leg I. It is possible, therefore, that this specimen is a member of that family. Ammotrechidae is divided into at least five subfamilies and some 22 genera. One of these (Ammotrechinae) embraces about half those genera, and tw0 of these (Ammotrecha and Ammotrechula), with more than 20 species, are represented in the U.S. and Mexico. At the same time, the taxonomy of this entire family is in flux, as are those of most other organisms, while academia comes to grips with a veritable explosion in the revelations of molecular genetic science. It isn’t presently possible to identify Sergio’s specimen to genera or species, but not because his photographs are incomplete. I am not sufficiently familiar with the salient features that distinguish them. Keys to the genera and species of the continental North American Solifugae (e.g., that of Jack O. Brookhart and Irene P. Brookhart, Denver Museum of Nature and Science, as published in 2006 [in the Journal of Arachnology 34: 299-329]) are being consulted in an effort to correct this deficiency. In the meantime, arachnologists familiar with these creatures are invited to comment on this post and supply added information, as appropriate. Another of Sergio’s photos shows the underside of this specimen. Two important characteristics unique to the solifugids are depicted in this photograph. First, notice the segmented abdomen. Click on the photograph (as with all of the photographs posted on this website, clicking on this image will bring up an enlarged version that can be analyzed more closely) to see these segments in larger size, and count them. Ten segments (the 10th is the nub, at the posterior end of the abdomen), as expected, are found. These arachnids do not possess book lungs, but have, instead, well-developed tracheal systems which take in air through three abdominal slits. Now notice the ventral (underside) surfaces of the femur of Leg IV (the underside of the first long segment of the leg closest to the abdomen). On each femur are found five light-colored, fan-shaped projections that are generally oriented perpendicularly to the long axis of the femur. These are sensory structures, known as racquet organs or malleoli.